Senior Special Assistant to President Buhari on Media and Publicity, Shehu Garba, has responded to criticisms by Nigerians over the frequent Foreign trips Buhari has made since he assumed office in May. According to Garba, the trips being made by Buhari are not for enjoyment. He said this in an article he posted on his facebook this morning. I have been amused, reading a number of jokes concerning the frequency of the President, Muhammadu Buhari's foreign trips. Questions have been raised about why so many visits, and what are the benefits Nigeria is getting? I will make it clear from the beginning that the critic is entitled to his and her opinion and nothing said here is intended to silence him or her. Criticism goes with the territory and as it is often said in a wisecrack, if you don't like the heat, get out of the kitchen. President Muhammadu Buhari came into office under the mantra of change. While Nigerians are yearning for change, you need someone who will set up the infrastructure, both at home and abroad for it. President Buhari is busy doing that. The change is manifest in where he visits and what he does. In the delegations accompanying him abroad, President Buhari has slashed the numbers, bringing them down to a tolerable or the bearable minimum. He went to the United Nations General Assembly in September with an unbelievable 32 officials in his delegation. These included his cook, his doctor and luggage officer. His predecessor in office went to the same meeting with 150 officials and family members the year before. Wherever they are given government accommodation and feeding, members of President Buhari's entourage receive reduced allowances, thereby saving the government some money. In public diplomacy, experts say that it is better conducted throughface-to-face interaction than through third parties. This is even moreso at the level of heads of state. To do by it by proxy is to miss the effect of fostering strong interpersonal relations between leaders, by which nations benefit. President Buhari has so far visited Germany, South Africa, USA, Niger, Tchad, Cameroon, Benin, Ghana, South Africa, India, Iran and Malta, where we are presently for the Commonwealth Summit. Mostly, these were due to either the United Nations, EU, African Union or energy and security-related summits. They were mostly undertaken to attend specific meetings, not State Visits. Looking at these assignments, the trips are inescapable for the President. What would Nigerians say of their leader when see the array of world leaders assemble, as they would shortly be doing discussing climate change in Paris on Monday and their own President is missing from the table? Those of us who were around under Abacha read all the taunts about him being a sit-at-home leader. Abacha was despised for not representing his country abroad. President Buhari's foreign visits have been marked by punishing schedules. They are always business-like and results-oriented. All trips have been marked by tight schedules. Meeting after meeting, happening back-to-back morning, afternoon and evening. The President has had to travel overnight for some of these meetings. The visit by any president to another country is the highest act in international relations. It sends out a message that that county is important to the visitor. It is not like your usual vacation abroad. Official discussions involving political leaders, the military, the diplomats and at times, business people are held at multi- track levels. In foreignpolicy you stand on a quick sand of events and you slip up if take a rest or lose focus. Governments also know that their achievements at home will be meaningless if they cannot project them abroad. Who or where are the foreign investors,whose hand you are seeking if you can't travel meet them? Will they come if they don't know about the country? President Buhari demonstrated a keen understanding of these when in the first week of his taking the office, he brought together foreign policy and all three cardinal objectives of his administration-security,economy and war on corruption- by embarking on visits to neighboring countries. In our recent history, much of the West had ignored Nigeria under the corrupt PDP administration for many years, which warranted the country's tilt towards some Asian countries. As a consequence, this country has suffered past isolation of various types, including the denial of access to the arms-purchase market. As a member of the then Standing Committee of the Nigerian Guild of Editors, I remember being in a delegation that visited the Aso Rock Villa, to beg the government at that time not the execute the writer and activist, Ken Saro-Wiwa. At the meeting with the Number Two man in that government, Major-General Oladipo Diya, he announced to everyone's shock and disbelief that Ken had been executed. "Honestly," he muted, "I think he has been executed about two days ago." What followed that pronouncement was a global outrage. The then Foreign Affairs Minister, Arch. Tom Ikimi representing Nigeria at the Commonwealth meeting in New Zealand, shattered the feelings of the leaders of those countries when he announced to them that he had not been briefed about the executions and begged for time to talk to the leaders back in Nigeria. Nigeria faced an imminent expulsion from the group and would have been so sacked but for the intervention of the then President of South Africa, late Nelson Mandela. In place of this extreme form of sanction, a suspension and and a barrage of sanctions followed and remained in place until an appreciable remorse was was shown and progress made towards the return to democracy by Nigeria. Throughout that period of time, it was difficult being a Nigerian in the international space. As council members of the UN Human Rights Commission, Africans would caucus in Geneva without us Nigerians. Like lepers, we were shunned wherever we showed up. I mentioned this short narrative to illustrate two things: one, for a country to do the right things all the time and two, you don't know the joy being a part of international gatherings until you suffer the pain of exclusion from them. Short of begging the world, there was nothing that the Abacha government didn't do to be taken back into the Commonwealth. And it is against this background that I felt the need to pen this opinion in the hope of bringing better understanding to fellow countrymen and women on the current subject matter. 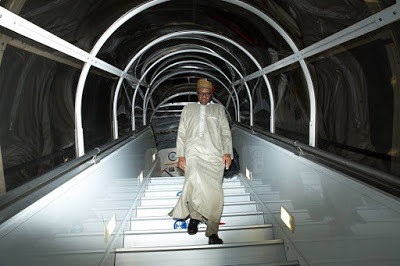 There is no reason to be angry with anyone criticizing President Buhari for traveling abroad. In politics, even if President Buhari were to bring with him a suitcase full of cash and a potgold each time he returned from a trip, someone will criticize him, saying that the journey is wasteful. The PDP will kick, knowing that they got 16 years and did nothing with it. Those who didn't do much during their term of governance will find it instructive to fault whatever the President is doing. If President Buhari is successful as a leader, the PDP will be history. My own point here is that he is doing a great job and the fruits are here, and many more will soon come. He is working to strengthen diplomatic relations, trade and the security of our nation. He holds serious meetings with serious investors and has fetched us investments in the range of billions of US Dollars. Now, countries such as France, UK, The U.S are supporting Nigeria with intelligence, weapons and training for our military against Boko Haram and the economic saboteurs in the Delta region. President Buhari will definitely make Nigeria great,what the PDP fooled us for 16 years. All heads of countries around the world now take Nigeria seriously. His foreign trips are for business, security of the country and bilateral contacts- contacts that get actualized by follow-ups and the love and support a leader enjoys at home and abroad. Today the world is in a warm embrace of President Muhammadu Buhari. Nigerians should be proud of the attention, love and admiration, importance, respect and investment he is bringing to Nigeria. These trips are not for enjoyment. Lastly, to answer those who ask all the time, what is he bringing back home? We are not a country of beggars. It is good if something is in the bag as the leader comes home from a trip. Culturally, we never return home from a trip without a souvenir for everyone left at home. Yes it is good he declares something upon his return. But the most important task for the President at this time is to reset the image of Nigeria abroad, given the damage it sustained over many years in the past. So far, in fairness, the President has projecteda large image of Nigeria and of himself which should be a matter of pride for all our citizens. Marketing of Brand Nigeria can never be more important than currently it is. The President is doing a great job for the nation. He needs to be supported.